DERRY CITY boss, Kenny Shiels has restructured his backroom team ahead of the new 2016 Airtricity Premier League season and handed long-standing youth coach, Hugh Harkin the assistant manager’s role. In a surprise reshuffling of his backroom team, Donal O’Brien has been appointed Head Coach while popular Rosemount man, Harkin takes the No. 2 role. Eddie McCallion (coach), Michael Hegarty (Physio) and Pearse Lafferty (Strength and Conditioning Coach), Gavin Doherty (Kitman) Seamus McGilloway (Video Analyst) and Dr. Joe McIlroy (Club Doctor) make up the rest of the backroom team. Harkin, has been heavily involved with the club’s underage set-up in recent years and has been a faithful servant to the Brandywell club for over 15 years. Therefore his appointment will be certainly be warmly welcomed by Derry City fans. Harkin worked under Shiels as a youth team manager when the Derry boss was managing Irish League club, Coleraine from 1994 to 2000. Explaining his decision to appoint Harkin as his assistant, Shiels said he felt the Rosemount man has developed into an excellent coach and deserves to be elevated into the first team ranks. “Hugh has done a fantastic job with the underage players and I’ve always had a good relationship with him going back to when we worked at Coleraine 20 odd years ago when he was the youth team manager,” said Shiels. Meanwhile, despite his initial disappointment with the FAI not to award his side a home clash against Finn Harps in the opening round of the SSE Airtricity League fixtures, Shiels is excited about beginning the new campaign with a local derby against the Ballybofey men. 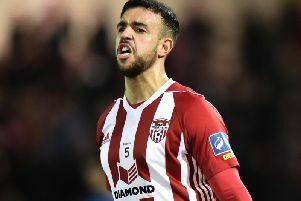 That match will of course mean Derry City midfielder, Barry McNamee comes up against his younger brother Tony in an interesting midfield battle while ex-City striker Ryan Curran a quick reunion with his old team mates having joined Ollie Horgan’s men in the close season. Following that trip to Finn Park, Derry will host Cork City on March 11th before travelling to Bray Wanderers the following week and hosting Galway United on March 18th. “It’s a tough start but we’re looking forward to it and we’ll go to Finn Harps with great excitement after getting a local derby in the first game,” added the Derry boss.